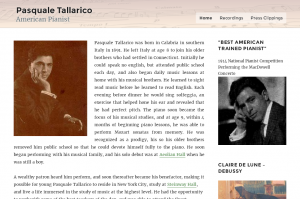 PasqualeTallarico.com is a site about an incredibly amazing person, my own Grandfather. My brother Frank Rexford designed the site and organized the content, and I put it into WordPress. I started with the WP Twenty Sixteen theme and modified the header and made some simple color changes. The sheet music you can see in the header is CLAIRE DE LUNE – by DEBUSSY, fitting for the site because that is what you can hear Granddad play. The MP3 file is embedded using a simple HTML5 <audio> tag.